Coffee Stain Studios stepped up to the plate for Sanctum 2 and knocked it out of the park, fixing the issues that kept the first game from being an instant thrill and adding tons of new content to keep players coming back for more. The original Sanctum was a tower-defense/FPS hybrid that blended two genres that, while sounding strange together, worked decently well. It felt more like an experiment than a fully formed experience, limited by a small arsenal, little to no perks for putting in the time to get better, and no interaction with enemies. Despite its flaws, it was full of promise and potential, hinting at a better game just underneath the surface. Luckily, Coffee Stain Studios stepped up to the plate for Sanctum 2 and knocked it out of the park, fixing the issues that kept the first from being an instant thrill and adding tons of new content to keep players coming back for more. This isn’t to say the title is without its flaws, but most of the time these can be overlooked because of the sheer enjoyment it provides. There isn’t much in the way of story, but for a game like this that isn’t much of a complaint. Skye Autumn, the heroine of the original, is joined by three new heroes to defend oxygen-creating cores from a race aliens hellbent on destroying them. 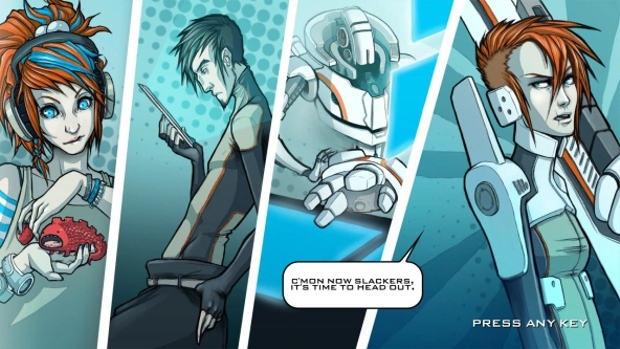 The story is told through well-drawn comics at the beginning of each stage, and it’s just enough compulsion to carry the game through. 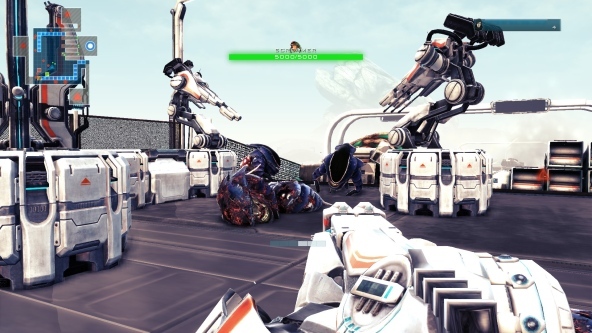 Aliens are defeated through a unique combination of FPS and tower-defense, both controlled by the player. Each stage is broken up into waves of enemies, who attack from one or multiple spawn points within the level. Each wave is divided into two parts: setting up the towers and then throwing yourself into the fray. Towers range from gatling guns to lightning bolts, with new options being unlocked as you level up. More slots become available as well, allowing you to have more options the further you delve into Sanctum 2. It’s also possible to set up blocks without weapons in order to guide enemies through a certain path. Weapons and perks are also unlocked with higher levels, making it easier to cope with the more intense waves of enemies. Although there are only sixteen levels, each one is broken up into multiple waves, making them last for quite a while. The difficulty curve raises fairly high early on, especially in single player, and losing a battle on your tenth wave after spending the better part of an hour defending the core is one of the most disheartening experiences ever. But the lonely single-player experience only serves to bolster the multiplayer aspect. Similar to Left 4 Dead and Payday: The Heist, single-player is functional, but multiplayer is where all the fun is at. Bringing in friends to set up a maze for the aliens while simultaneously blasting them to bits is insanely fun and addictive. Working out a strategy that finally works after a long string of defeat is absolutely exhilirating. As if the leveling up, unlocking items and perks weren’t enough to add to the variety, you can now turn on Feats of Strength, which serve as challenges that add to the already high difficulty as well as boosting XP gained in each stage. Whether it’s giving enemies a speed boost or letting them regenerate wounds, these definitely add to the difficulty and the reward of success. Enemies have a brand new AI working in their favor, as they now attack the player instead of marching forth stubbornly. On top of that, there are plenty of new alien types added to the fray that make defending the core a tough job. 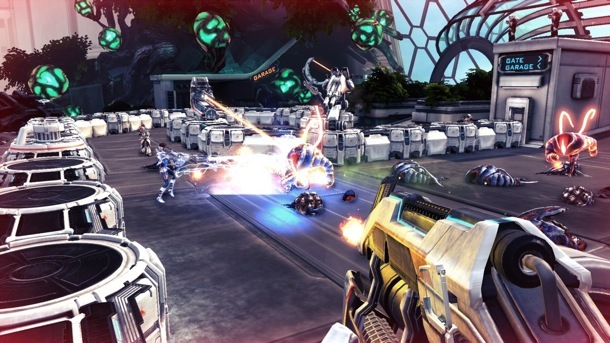 Sanctum 2 also allows aliens to attack the core, piling on even more stress and reward. Luckily, Skye’s new friends bring a fancy new class system with them, allowing players to choose between assault, sniping, shotgun specialist, or heavy weapons to disintegrate their foes. Much of the difficulty comes from the overwhelming forces of enemies that come after the core, but some of the time, the layout of the levels seem counterproductive to protecting the core. Some levels provide you with extremely limited space for setting up guns, and any allies you have that aren’t human are killed with one hit, making them the most worthless help I’ve ever seen. Although no challenge is insurmountable, some stages can feel cheap, especially during solo play. Sanctum 2 also takes the XCOM approach to introducing enemies, which means they don’t. It’s not even made apparent that boss creatures exist until one is tearing through your meticulously-placed barriers during the last wave of a tough battle. Needless to say, despite a few issues, Sanctum 2 has added a plethora of options to a unique blending of two genres that, on paper, sound like they shouldn’t work. But somehow, Coffee Stain Studios have made this work wonderfully, making Sanctum 2 an incredibly fun and addictive experience, especially if you can get some friends to join you. For only $14.99, it’s a quality title that shouldn’t be missed.